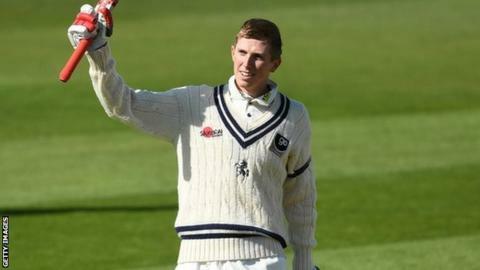 Kent opening batsman Zak Crawley made the second first-class century of his career to help his side dominate the opening day of their Championship Division One match with Warwickshire. Facing the side with whom they were promoted from Division Two last September, Kent closed on 367-5. Centurion Zak Crawley led the way with 108 against a largely young home seam attack, supported by Heino Kuhn's 72. Bears debutant Craig Miles took two of the five Kent wickets, but expensively. Kent's 20-year-old wicketkeeper Ollie Robinson was still there at the close on 59, having so far put on 44 for the sixth wicket with 42-year-old Darren Stevens. Stevens, now two games into the 23rd season of his career following last week's opening defeat by Somerset, will resume on 19. It has so far proved a happier visit to Edgbaston for Kent, who lost in Birmingham in the final game last season, to enable Warwickshire to claim the Division Two title. But, in their first game of 2019, the Bears, who are without Chris Woakes, Olly Stone and Liam Norwell, can point to the length of their injury list. That triggered a call-up for former Bears and Derbyshire seamer Tom Milnes, who is uncontracted but back on trial at the club he left in 2015. "It is an absolutely top-drawer wicket. It's testament to our groundstaff - the best in the business. A good wicket to win the toss and bat on. "Zak Crawley batted very well. But, at 204-4, when he was out, the game was in a position where it could go either way after the bowlers had worked hard and maybe not got their rewards. "Then we just let the game drift. There were a couple of dropped catches which isn't ideal. But that is a proper day of First Division Championship cricket where you've got to work to get your poles." "It's been a perfect start to the game. Hopefully we can go on to a big total, bat once and see if we can bowl them out twice. "I was very pleased with the century. I was on 99 for a while which was a bit nerve-racking but pleased to get there in the end. "It was a lovely deck to bat on this early in the season, I am amazed how well the groundstaff have done."